Various tinkling notes. Song starts with 2 or 3 melodious phrases, ends with fast tinkling trill. Description: Sexes similar. Large triangular black patch on throat and breast; black lores. Contrasting white eyebrow; white whisker stripe; unstreaked white underparts. 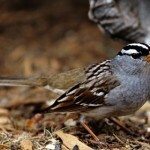 Upperparts are unstreaked brownish-gray; lacks wing bars. Black tail has white corners and outer tail feathers. 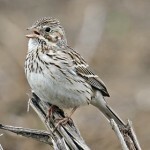 Juveniles lack black bib and are finely streaked on breast and back. Habitat: Usually found in cactus and sagebrush deserts, especially on rocky slopes. Where in Nebraska: Accidental. Reported from Sioux County in 1972, Douglas County in winter of 1973-74, Keith County in 1984, and in Lancaster County in 1993. Rare casual fall and spring visitor. 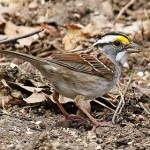 Field Notes: Black-throated Sparrows have a high tolerance for heat and drought. 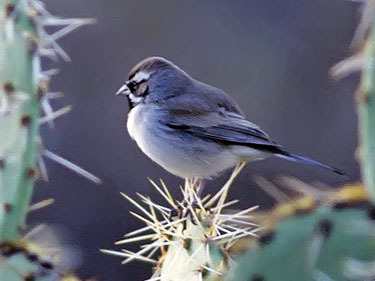 Also known as “Desert Sparrow” in southwest U.S.
Fun Facts: Black-throated Sparrows can withstand long periods of time without water and instead obtain water from the insects and seeds they consume.